If you think having a soft, pinkish, and luscious lips is impossible to achieve without a lip balm or lipstick, you’re wrong. Pretty pink lips are definitely an attractive facial feature, but because most women are suffering from chapped and dry lips, they often end up using lip balm to hide this problem. Your lips are more sensitive than you think. In fact, dull and pigmented lips speak volumes about your health. That is why you need to give extra care and attention in order to keep your lips looking naturally soft and smooth. 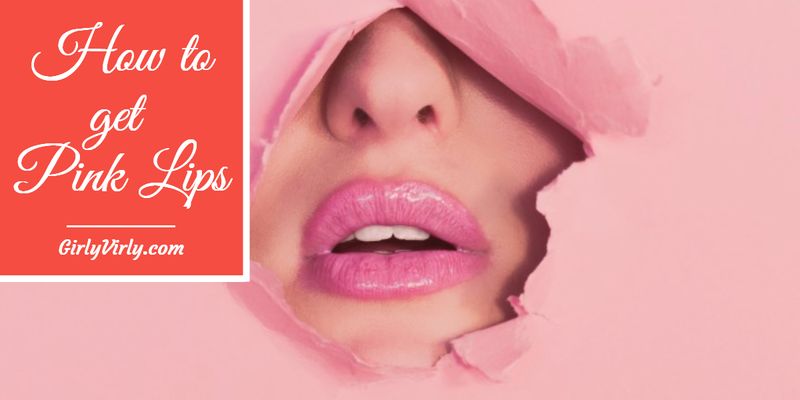 If you are wondering why your lips seem dry, cracky and pigmented, then there are a lot of things that may be responsible for these problems. But it does not mean that you can’t change your lip texture or color. There are many ways to lighten dark lips and restore their natural smoothness. Follow the home remedies below if you want to have soft and kissable pink lips. One of the most effective ways to get naturally pink lips is to exfoliate them regularly. This method does not only remove the dead and flaky skin of your lips, but it also heals cracks and helps restore moisture. Make a thick paste by mixing two spoons of sugar powder with one spoon of butter. Use this mixture as a scrub over your lips. A soft toothbrush is a very good exfoliator for your lips. Apply a bit of the turmeric paste on all over your lips and let it remain for 2-3 minutes. Then exfoliate your lips again gently with the soft toothbrush. And then apply a lip balm. Mix one or half teaspoon of squeezed lemon juice with some coconut oil and add one teaspoon of granulated sugar. Then apply it on your lips and exfoliate it for 2-3 minutes. Every night, apply honey all over your lips and let it dry and leave it overnight. Lemon is a miraculous remedy for so many health problems and chapped, dry lips are among them. This natural home remedy intensively moisturizes your lips and effectively helps in making them look soft and healthy again. Squeeze a lemon in a bowl and apply its juice on your lips before going to bed. Follow this simple home remedy daily for one to two months. Take a thin slice of lemon and sprinkle a bit of sugar on the top and rub it on your lips. It will exfoliate dead cells so that new fresh skin can appear. Do this home remedy daily for a few weeks. Prepare a mixture of one teaspoon lemon juice, glycerin, and honey and apply this mixture on your lips before going to bed. Do this daily until you start seeing positive results. Turmeric powder has some bleaching properties that helps in lighten the lips. Turmeric powder also reduces hyperpigmentation and restore the original color of lips. Take some turmeric powder in a bowl and add cold raw milk accordingly to make thick paste. Apply the paste on your lips and let it sit till paste dry. Wash the paste with gently massage on lips. Follow with a lip balm. Olive oil is a natural lip moisturizer. Scrub olive oil onto your lips before you sleep at night to soften your lips. After applying, gently massage your lips for ten minutes and leave it overnight. Olive oil helps in nourishing and moisturizing your lips and gives your lips natural glow. You can also add brown or white sugar for best results. You can buy different types and colors of lipsticks if you want to make your lips look kissable, but your lip problem can only be resolved by treating it naturally. With these all-natural home remedies, you can be sure that your lips will look beautiful even without an expensive rouge.